M T D O c t o b e r 2 0 1 8 52 S m a l l O T R T i r e s T he first Pirelli-brand off-the-road (OTR) replacement tires arrived in the U.S. in late September des- tined for markets along the coun- try's southernmost cross-country interstate highway, Interstate 10. "Anything to the south of California to the north of Florida is basically where we are focusing," says Alex Vitale, CEO North America for Prometeon Tyre Group Com- mercial Solutions LLC, the commercial arm of Pirelli Tire North America Inc. "We have a good concentration of dealers in this area that sell both truck and OTR products." e arrival of the Pirelli OTR tires at the Savannah, Ga., port marked the brand's entry into the U.S. market. "We deliver containers direct to dealers," says Vitale. 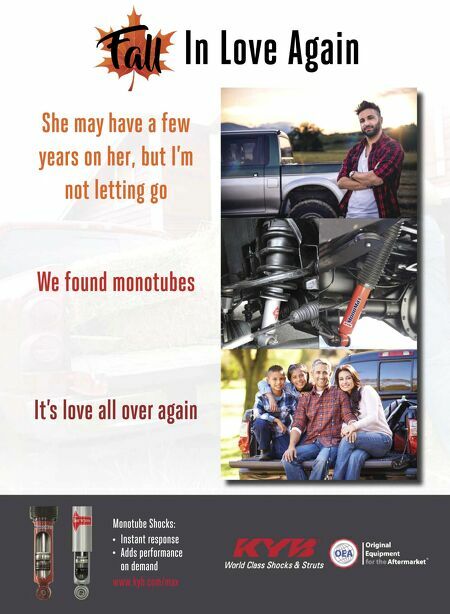 "Quite a few of our dealers take mixed loads of truck and OTR tires." Vitale says Pirelli does not intend to be heavily involved in distribution. "We give a few dealers their area to work and leave it up to them to push the product all the way through." e company has a warehouse in Rome, Ga., but it will be used mainly for distributing medium truck tires. "We try to avoid using the warehouse for agricultural and OTR products. Just the size and the movement make us less competitive. We try to ship direct shipments from Brazil right to our customer." Several dealers are selling Pirelli OTR tires, which range up to 29 inches in diameter, in the U.S. Six models are currently available for loaders, graders, dump trucks, forklis, and other construction applications, as well as for cargo handling equipment at ports. Prometeon Tyre Group Commercial Solutions is headquartered in San Diego, Calif. e company introduced the first Pirelli-brand truck tires, the TG:85 and FG:85 series, in the U.S. in April 2017. "With our introduction of our commercial truck tires in the U.S., the plan was always to introduce Pirelli industrial tires to the marketplace," says Vitale. Vitale says the company intends to expand the OTR tires to the entire U.S. market, but he did not specify a time frame. He did, however, name when Pirelli brand farm tires will be available in the U.S. "We are still testing in the market with great results. We should be introducing ag in January of 2019." e tires for the U.S. market are made at Pirelli's OTR and agricultural tire factory in Brazil. Pirelli has been supplying replacement OTR and ag tires and original equipment fitments to the Latin America market since the 1970s. "We've had a long history in Latin America both on agricultural and OTR. 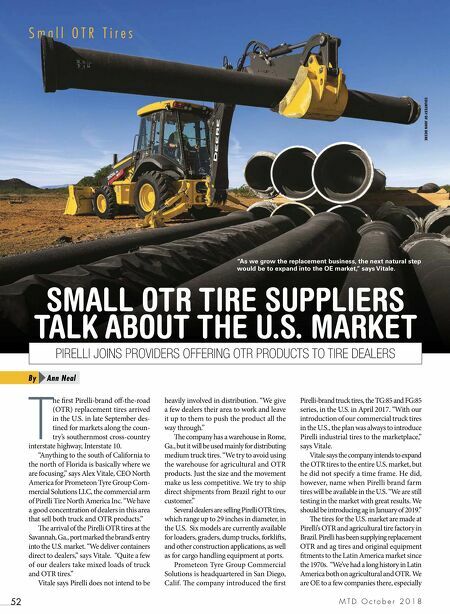 We are OE to a few companies there, especially Ann Neal By PIRELLI JOINS PROVIDERS OFFERING OTR PRODUCTS TO TIRE DEALERS SMALL OTR TIRE SUPPLIERS TALK ABOUT THE U.S. MARKET COURTESY OF JOHN DEERE "As we grow the replacement business, the next natural step would be to expand into the OE market," says Vitale.